After watching Emma Thompson’s portrayal of author P.L. Travers in Disney’s “Saving Mr. Banks,” I researched the truth of the story in articles by the New Yorker – Becoming Mary Poppins – and in the New York Times. Satisfied that Hollywood had not strayed too much from the truth – except that Walt Disney never escorted Travers to Disneyland, nor bonded with her over their fathers, nor sweet-talked her through the rights to the story – and he conveniently omitted Jane and Michael’s younger siblings. When I looked for the children’s books in our library system, I found a series and started with the first, appropriately named “Mary Poppins.” Each chapter offers another adventure – many mirrored by Julie Andrews in the Disney movie: Mary Poppins gliding up the bannister, Mary and Bert jumping into the chalk drawing for a wonderful adventure, Mary’s laughing uncle serving tea on the ceiling, the bird woman with her chant – “Feed the birds. Tuppence a bag.” Other adventures were new, but no less endearing and fun to read: the talking dog, the sauntering Red Cow who met the King who advised her to jump over the moon – and beautiful illustrations by Mary Shepard. No singing in the book, and, of course, no animation of the talking animals, but sweet sayings that sounded familiar: “spit-spot, don’t dawdle, that is as it may be…” And, that good feeling from reading a lovely children’s story full of adventure and fantasy. 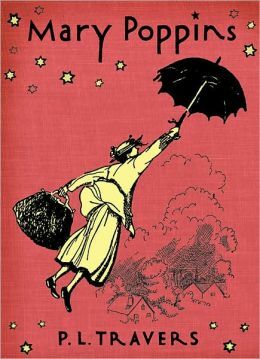 Mary Poppins does leave in the end of this book, flying away under her umbrella, just as she does in the movie. But she comes back; Travers followed this first book with several more. Three are waiting for me at the library, and I can’t wait to read them. This entry was posted in authors, biography, book review, books, children's books, children's literature, classics, essays, humor, reading and tagged books, Children's literature, Disney, Emma Thompson, England, humor, Julie Andrews, London, Mary Poppins, P L Travers, Saving Mr. Banks, Walt Disney, Walt Disney Company. Bookmark the permalink.